Can’t wait for PR3.0, new UI which features (amongst many things) a drop down status bar with quick access settings (Maemo esque)? Two positions panel of fast access to frequently used functions. 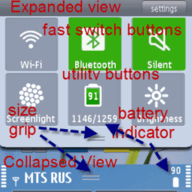 Expanded view displays a fast connection to Wi-Fi, Bluetooth, turn Slient mode. 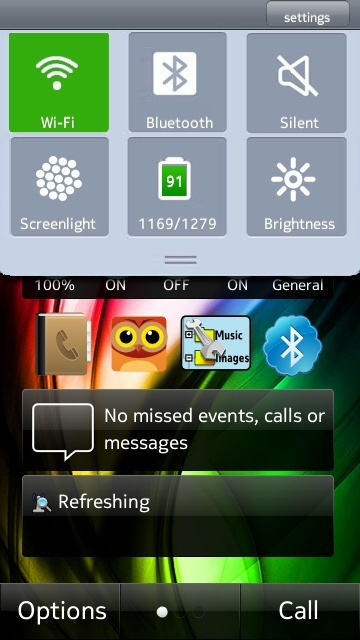 Utilities: On-screen torch and adjust the brightness. Displays the battery level (in terms of capacity). In Collapse: the battery level and fast lock your phone (top left corner of the screen). Allows you to unlock your phone by pressing the camera key. Languages: en, fr, ge, sp, it, ru. Cheers for the tip, Nokiafan!